Mikimoto White Round Pearl Pin/Brooch . It is marked M in a clamshell (Mikimoto) and S (sterling silver). Nice swirl design that can be worn at several angles. There are 5 smaller pearls that are about 3mm and 3 larger pearls at about 5mm. Pearls have a beautiful luster & are very high quality that is always found in MIKIMOTO creations. Stamped with M MIKIMOTO hallmark & K14(pictured). Estate sale find beautiful Mikomoto 14k yellow gold 3 pearl stick pin. This lovely brooch has a locking clasp and weighs 4.1 grams. Brooch is hallmarked Mikimoto with the M, 750 ( 18k). 5.2 to 5.4mm genuine Akoya Mikimoto pearls. Marked with the Mikimoto "M" in a Shield / SILVER as shown in photo. Available for sale is a very nice 18k white gold Mikimoto double circle diamond pendant. The two circles are interlocked and offset from one another, both with a slight curve integrated in them. The smaller, top circle has a total of 24 diamonds, the larger circle has a total of 27 diamonds. The brooch is set in Sterling silver and has 11 exquisite cascading Akoya white pearls. The pearls have a wonderful high luster and are in excellent condition. The brooch is stamped K. Mikimoto Japan and has a M in a circle and an S for sterling. This piece is designed out of 14K yellow gold. This features 5 authentic pearl that range in size from 5mm to 7.5mm. The total weight of the piece is 13 grams. On the back this is marked K14 along with the M in shield for Mikimoto. Pearl color: Pinkish White, Luster: Good, Quality grade: A . Pearl size ranges from 5.00MM to 7.5MM. I have blanked out my personal information but will be including this appraisal with the piece. I see no imperfections whatsoever. Very good condition with light tarnish to the silver. Marked with the Mikimoto M and S marks. Weighs 3.5 grams. The back pin functions correctly. Gorgeous brooch. A CASE WILL OPEN IF ITEM IS NOT PAID FOR. Here we have a gorgeous Mikimoto 18k yellow gold pearl and diamond snowflake pin brooch. This is such a pretty brooch, most Mikmoto brooches are floral designs, but this one is different, and very pretty! It is fully hallmarked, but has been tested, and verified weighing in at 9.6 grams. There are no problems other than ordinary and normal use marks. This brooch would be a great addition to any collection and would be an amazing gift! This is a Mikimoto pearl brooch from the 60s which belonged to my mother. It is stamped M in oyster shell and K14 which is the hallmark of Mikimoto. There are 7 pearls that are 7 mm in size with beautiful luster. Beautiful vintage 14k yellow Mikimoto Akoya pearl pin/brooch in an autumn leaf/grape leaf design. The pin has very pretty, intricate detail accenting a cluster of five pearls. The five pearls are graduated in size from about 6mm to 4.5mm. Pearls are highly lustrous. The brooch measures 30mm by 30mm (about 1-3/16″ x 1-3/16″). The leaf has a textured matte detail with milgrain edges. The looping curlicues are scalloped with detailed laser cuts, and also have milgrain detail. The pin/brooch weighs 6.4 grams. The back is marked K14, and signed with the Mikimoto “M” in a shell logo. This estate pre-owned pin/brooch is in excellent overall condition, with a working clasp. Mikimoto 14 KT Solid Gold tie bar with one 7.00 mm Akoya saltwater pearl! This tie clip presents itself very Elegant and is in wonderful condition! MIKIMOTO 18ct WHITE GOLD & CULTURED PEARL STYLIZED HEART BROOCH, 1-1/8" x 1". Condition is Pre-owned. Shipped with USPS First Class Package. This lovely brooch has a locking clasp and weighs 7.3 grams. Brooch is marked Mikimoto, Tokyo, 14k. Up for Sale is an Authentic 14K Gold Mikimoto Brooch. Set With 10 Cultured Pearls. In Lovely Condition. Gorgeous, classic pearl brooch by Mikimoto in 14K yellow gold. This is the Tree of Life brooch. Well crafted with twelve pearls ranging in size from 3.99 mm to 5.42 mm. Fully hallmarked K14 with the M in a clamshell. You are viewing a beautiful Mikimoto cultured pearl cluster pin in 14kt gold in a light ribbon design. This pin is an elegant classic with 8 pearls - 2 clustered on one side and 6 clustered on the other side. It measures 1 3/4 inches wide and 1 1/2 inches tall. It is marked (see picture). The pin is in beautiful condition!! This is a timeless classic for your collection!! I accept Paypal and only ship directly to addresses within the United States that are verified and confirmed. Please make payment for purchased items within 3 days of the auction's close. If you have any questions, please do not hesitate to email me. Happy Bidding!! Vintage sterling silver Mikimoto pearl brooch. The brooch is stamped MS and measures 3.4 cm. This Authentic Mikimoto Pin is hallmarked "Mikimoto Logo Sterling". Up for your consideration is a beautiful Authentic Mikimoto Sterling Silver White Akoya Pearl Brooch. All of the pearls feature beautiful color and high luster. 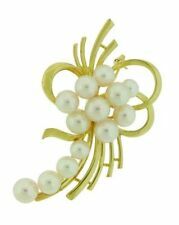 For your consideration a beautiful Mikimoto 14k Yellow Gold Leaf Flower Vine Brooch with 5 1/2 mm round white pearls. Pure perfection from Mikimoto, this beautiful authentic and elegant brooch is crafted from solid 18k yellow gold with a fine polished finish and is in the design of a lovely curved ribbon loop with the ends flowing and five lustrous Akoya pearls set in a cluster in the center of the brooch. Estate. 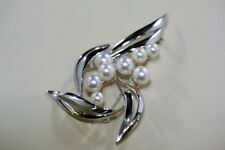 Fine Mikimoto 8 Pearl Pin done in Sterling Silver. Marked on reverse with "M" Clam shell and S for Sterling. Great ribbon lines in background. Fine pre owned condition. Vintage Signed Small Mikimoto Akoya pearl in Sterling silver Pin.. Condition is perfect Pre-owned. See4th photo stamped M and S. Shipped with USPS First Class Package. 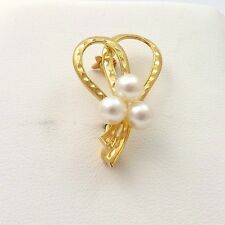 Mikimoto 14k Yellow Gold Akoya Pearl Pin Brooch. 14k yellow gold pin weighs 16.7g. Pin stamped " M " " K14". Pin is in excellent condition. No fakes, no lie, no hassle. Mikimoto Hallmark ! These Earrings have. MIKIMOTO PEARL SWIRL PIN. 14 Kt YELLOW GOLD. Mikimoto Pearl Wreath Brooch in 18K yellow gold featuring 14 pearls of 4 mm size. Brooch has a safety latch clasp. It is fully hallmarked, has been tested, and verified weighing in at 7.3 grams. There are no problems other than ordinary and normal use marks. This brooch would be a great addition to any collection and would be an amazing gift! 14K Yellow Gold. We are Burleson Gold & Silver located next to the Starbucks in Burleson, TX. The item pictured is the item you receive. You receive the item as is. Marked 14kt and tested, "M" Mikimoto symbol. This pin has a graceful sweep design and features 12 round pearls ranging from 5 mm to 7 mm. These pearls are white with very good luster. This beautiful Pin/brooch is in very good to excellent condition, very good working clasp. Mikimoto Butterfly Brooch in 18K yellow gold with one 7.5mm pearl at center. Brooch has a safety latch clasp. Necklace / Pendants. Gold Charms. Pearl color.. Slight pink tone "High quality". Silver Jewelry. M, Trademark, 750. Our exceptional reputation matters most to both us and you …. This is a gorgeous and very wearable piece, and is signed "M" and "750" on the back side. The pearls are a creamy white color with a slight pink sheen, and slightly variable in size. They are all round. AKOYA PIN BROOCH. STERLING SILVER. MARKED "M" "S".